When Robert Coplan and an anonymous donor founded College Now Greater Cleveland in 1967 (then the Cleveland Scholarship Program), their goal was, at its core, simple: to find a way to enable all students in the Cleveland Metropolitan School District (CMSD) to go to college. They started their work by offering scholarships to CMSD high school students, but soon saw that students weren’t taking the money. Why? Because they didn’t know what they needed to do to get to college; there needed to be a culture of college knowledge created in the school buildings, and the community, to show these students the steps they needed to take to apply to and get accepted into college. It was out of this that College Now as we know it today was born. Robert Coplan and the anonymous donor began placing advisors in CMSD high schools to give students advice and guidance on the college-going process, and the work soon grew so that College Now was serving students throughout Northeast Ohio and adult learners. 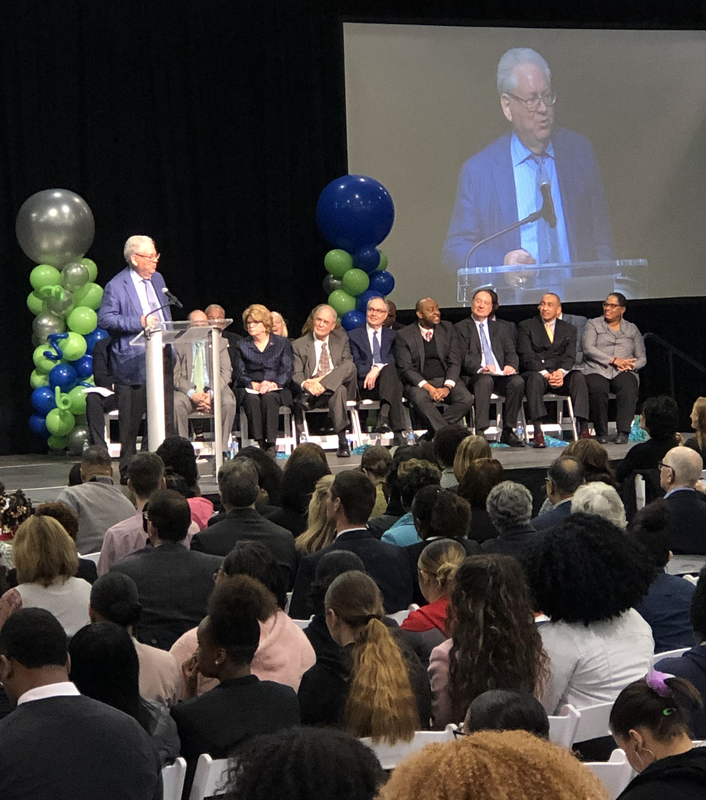 Throughout all that growth and transformation, though, the original dream of Coplan and the donor has always been there: to find a way for all CMSD students to afford to go to college. As other cities throughout the nation have developed strategies such as promise programs and universal scholarships, our community contemplated these things, as well, wondering what we could do in Cleveland to achieve the dream that Robert Coplan and that donor set out to achieve over 50 years ago. And then, the opportunity presented itself in Say Yes to Education, a nonprofit that helps communities improve education by providing support services and tuition scholarships to students. Cleveland has long been a community that works together to make the impossible happen. That is why, when the time came to find a way to get all CMSD students to college, it would be a community-wide effort that would be successful. Almost three years ago, a group of like-minded organizations and community representatives got together to start the work of turning Cleveland into the next Say Yes to Education city. Through deep, intense community commitment, which included evaluating all the services in Cleveland currently providing student supports, reviewing how those services can deepen and become even more effective, and raising $88.4 million, the dream of College Now’s original founders is finally being realized. As a Say Yes to Education chapter, students will receive services in schools and tuition scholarships once they graduate from a CMSD high school. Services in school will range from legal and health services to college and career advising, all the way from kindergarten through twelfth grade. Students will be able to receive one of two scholarships once they graduate: a Say Yes Cleveland tuition gap-closing scholarship available to all eligible students attending an Ohio public four-year university, two-year college, or Pell eligible trade-certificate program, or a Say Yes Compact tuition gap-closing scholarship available to all eligible students attending over 100 private colleges in the Say Yes Higher Education Compact nationwide. It is the hope of the entire Cleveland community that offering these intensive, wraparound services with a gap-closing tuition scholarship award will completely change the postsecondary conversation in Cleveland. We know that education is the key to so many opportunities post high school, and that an educated workforce is what Cleveland needs to be competitive in the national economy. The support from the community on this massive project shows that they understand this need, as well, and are willing to dedicate resources to make it happen. The impact that Say Yes Cleveland will have on these students and their postsecondary journeys is one that College Now has dreamed about since 1967. Together, the Cleveland community has realized this dream and made it a reality. We cannot wait to see how Say Yes Cleveland changes the conversation about education and changes these students’ lives. To all of our partners who worked tirelessly to bring Say Yes to Cleveland, we cannot thank you enough for your support in this endeavor. To learn more about Say Yes Cleveland, including residency and enrollment requirements for receiving the Say Yes Cleveland Scholarship, visit www.sayyescleveland.org.